God's seven annual festivals picture the steps in His master plan for reproducing Himself through mankind. The first three festivals occur during the spring. They picture great events leading to the first spiritual harvest of Spirit-begotten human beings into God's universe-ruling Family. Recall from previous studies that the Passover is a memorial of Christ's sacrifice for our sins. The Days of Unleavened Bread picture our putting away of sin and our constant need to obey God. Pentecost pictures the spiritual begettal of the firstfruits of God's plan. The last four festivals are kept during the fall. They portray tremendous events yet to occur in God's plan. We learned that the Feast of Trumpets pictures the return of Jesus Christ to raise the firstfruits to immortality and to set up God's government on earth. And the Day of Atonement pictures the deposing, removal and binding of Satan for 1,000 years. With Satan's sinful influence gone, mankind can then be reconciled — made at one — with God. This brings us to the sixth festival and the subject of this study. Let's learn the next step in God's master plan of salvation for mankind. 1. What God-ordained festival occurs only five days after the Day of Atonement? Lev. 23:33-34, Deut. 16:13-15. 2. Does this Feast begin with a holy Sabbath or high day on which all ordinary work is forbidden, and on which the people were to gather before God? Lev. 23:35. Did God command that this annual Festival be kept forever? Verse 41. The Feast of Tabernacles was also called the Feast of Ingathering (Ex. 23:16, 34:22) because it began just after the autumn harvest was reaped and stored (Lev. 23:39). This fall harvest Festival was to be a time of great rejoicing and thanksgiving for God's abundant blessings. Today, we understand that it pictures the future ingathering of the great harvest of Spirit-begotten human beings into God's Family during a 1,000- year period known as the Millennium. Let's understand. 3. Does the annual Feast of Tabernacles last for more than one day? Lev. 23:34, Deut. 16:15. As we learned in previous studies, God used the yearly harvest seasons in the land of Palestine to picture the future spiritual harvests of mankind into His Family. The spring grain harvest is small compared to the great fall harvest. The first harvest, represented by a single day — the Festival of Pentecost — pictures the relatively small number of people God has called into His Church before Christ's return when they will be born into God's Family. But the Feast of Tabernacles in the fall each year lasts a full seven days. This shows that God's great fall harvest of mankind will take a longer period of time to be reaped. People will be born physically, called of God and born spiritually into His Family all during the thousand years, after fulfilling their life's purpose of growing in God's character. God chose where His people were to keep His Feast. Today, God works through the government He has placed in His Church. God leads those in charge to select appropriate Feast sites around the world to accommodate the members of His worldwide Church. These are attended by tens of thousands of God's people and their families during this great fall Feast. 5. What is the divinely set theme for the annual observance of the Feast of Tabernacles? Deut. 16:14-15. 6. Does God say that good food should be eaten to increase one's joy and happiness during this Feast? Deut. 14:26. The Feast of Tabernacles is a time of great rejoicing! For ancient Israel it was a time of rejoicing because the abundant winter's store was taken in just before the Feast. 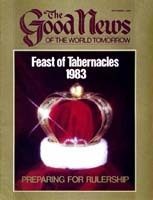 But in the Millennium, the happiness, joy and prosperity pictured by the Feast of Tabernacles will exist worldwide under the righteous rule of Jesus Christ. Obedience to the laws of God and His way of life will make the world tomorrow a literal utopia. 7. Are God's people to live in booths — that is, in temporary dwellings — during the Feast? Lev. 23:40, 42. A tabernacle is a dwelling God commanded the ancient Israelites to live in temporary shelters made of tree branches while observing this Feast. For God's people who attend the Feast today, a temporarily occupied dwelling such as a tent, camper or motel or hotel room would qualify as a booth. God intends the Feast of Tabernacles to separate and free His people from the world. Living in temporary dwellings for an entire week — away from their everyday surroundings, jobs and most negative influences — God's people enjoy a tiny foretaste of the universal freedom, joy and peace that will exist in the Millennium, when Satan is gone and the Spirit of God is leading all of humanity (Joel 2:28, 32). These are days of continuous, genuine Christian fellowship and just plain good fun. Christians at the Feast demonstrate now, by the way they live together in harmony, what this entire sin-sick, unhappy world will be like after Christ returns. Members of God's Church receive instruction from God's ministers through inspiring sermons to help them further qualify to rule with Christ during the Millennium. 8. After Jesus Christ subdues the warring nations at His return and establishes God's government over the earth, will the nations begin to come to Him for instruction in God's way of life? Mic. 4:1-2. Will the whole world finally come to understand God's way to peace, happiness, abundant living and salvation? Isa. 11:9, Jer. 31:34. Once Satan has been bound and the government of God set up, a 1,000-year golden age of world peace and prosperity will begin. It is then that preparations for reaping the great spiritual harvest of mankind into God's Family will also begin. Christ's reeducation program for the entire world will bring about a new civilization based on God's way of life — His law of love — resulting in great physical and spiritual blessings. 9. But what will happen to those nations that at first refuse to be reeducated to God's way? Zech. 14:16-17. And if they still won't obey? Verses 18-19. Christ will immediately start to reeducate the people of the world through His annual festivals. The world will come to know that God's master plan pictures the way to physical blessings and spiritual salvation. Those who stubbornly refuse to keep the Feast of Tabernacles will suffer from drought and plagues until they submit to God. 10. Is there to be any end to the increase of God's government? Isa. 9:7. World population in the Millennium will increase rapidly. Billions will eventually be converted. The great autumn harvest of human lives will be gathered into the Kingdom of God — born again as divine members of the universe-ruling Family of God. By the end of the thousand years, the Family will be ready for the final step in God's master plan. Even greater joy and accomplishments lie ahead after the Millennium! The next and final study in this series will explain.